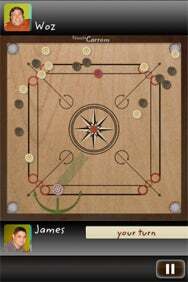 Touch Carrom by Zentity brings the tabletop game of carrom to the iPhone or iPod touch. Carrom is a cross between billiards and shuffleboard that has gained popularity throughout the world. Now Zentity hopes to translate the game's popularity to a new market of gamers. Touch Carrom faithfully replicates an official carrom board on your iPhone—albeit much smaller than your standard tabletop version. On the board are two sets of nine carrom-men, the queen, and a striker for the active player. Your objective is to pocket or “pot” your carrom-men into one of four corner pockets using your striker before your computer controlled opponent does. Each carrom-man you pocket earns you a point, and the queen counts as three points. Like billiards, you alternate turns unless you pot a carrom-man on your turn. Lining up a shot can be tricky with the small pieces. Use you finger to slide your striker along a line and set up your shot. Adjust the angle and velocity and let it fly. It takes a bit of practice, but before long you can get proficient making shots you actually planned instead of just relying on luck. The physics are very well done, but frame rates do suffer a bit when there are more pieces and many collisions taking place. The computer-controlled opponent will give you a good game, but there isn’t a way to adjust the difficulty of the AI. Fortunately, a pass-and-play multiplayer mode is included to challenge friends. While it lacks a true online multiplayer feature and much depth, fans of billiards or shuffleboard should give Touch Carrom a shot. Touch Carrom: Striker Edition is compatible with any iPhone or iPod touch running the iPhone 2.0 software update.